Earlier today Google announced Android Wear, a new platform designed with smartwatches and other wearables in mind. Shortly after this, both LG and Motorola announced their own watches that will utilize the platform. Although there is still a lot of unknowns related to Android Wear and the products that will utilize it, Google’s Developer site certainly helps paint at least a little clearer picture of what to expect from devices that use the platform. As for how it works? The new UI basically has two main areas, the Context Stream and the Cue Card. The first of these is basically a vertical list of cards that show notifications and other useful information in a way that is fairly similar to Google Now on Android phones and tablets. It’s important to note that each of these cards may also have additional pages of information that you can access by swiping horizontally, including tappable buttons that allow you to respond to notifications and more. You can also easily dismiss cards by simply swiping left to right. For those wondering how obtrusive the cards (and/or general notifications) are, Google makes it clear that only important notifications will actually buzz or make a sound on your wrist, basically the same kind of notifications that would alert you on a smartphone. It’s also worth mentioning that Google Wear devices will be aware of your location and even certain types of movements, so that way select apps for biking, hiking and other activities can present cards relevant to the situation. App developers can also choose to send only certain types of notifications and cards when you’re at home, at the gym, etc. Aside from the context stream for notifications and other important data, there’s also the Cue Card interface. This UI is brought up by simply saying “OK Google” or by tapping on the “G” icon on the home screen. From here you can either say a specific command, you you can scroll and tap on a list of possible commands. Developers will be able to link some of these specific commands (like calling a cab) with their apps, and it will be up to you to assign which apps are utilized with the command by default. As you can see, the new Android Wear platform makes most of the existing smartwatches look like nothing more than cheap toys. The ability to offer rich cards, notifications and voice-driven command support could be a real game-changer and may be exactly what is needed to make smartwatches a must-have product in the near future. Obviously there is still a lot we don’t know about Android Wear and partnering products, but we’ll be sure to keep you updated as we learn more about the platform and the smartwatches that will be taking advantage of it. 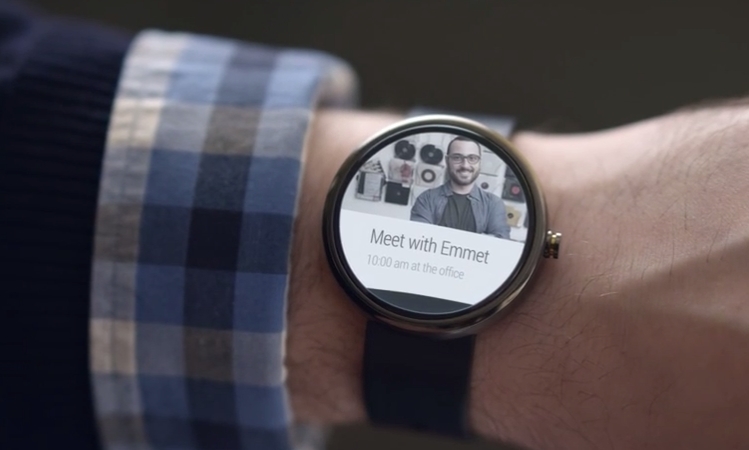 What do you think of Android Wear based on what we currently know, impressed or indifferent?